It isn't correct and I'm still waiting for my + screws.... but I like it. I have been waiting for my stock from IWD for almost 4 months... Got this stock from MrM1A1 last week, and its perfect!! Last edited by Flypaper; January 13, 2018 at 12:59. Cool.. Nice rifle! Were they basically an ex/kanada series with a diopter sight and Unique flash hider? Interesting that with the early features on the rifle that they also had a type 1 lower and type B stock ratger than an A. Were lugged barrels the norm? Is the carry handle corrsct as well with that furniture configuration? Have to look through my Stevens book again. Dang it!! Is that worse than a mag foul? Thanks guys for the positive comments. I will be sure to correct my diopter snafu post my pictures.... again. Being in such a hurry to get it together and get pictures before it got dark that I never even realized it. I'm taking it out this weekend to sight it in. Do you know what the correct sling is for it ? Are barrels left or right handed thread? I am not sure what the original thread hand was. My flash hider was made by L/FN and it was a left-hand thread. When Dr Shock made his I suggested he do the same. Most of the barrels are a left-hand thread and would save on the Gunsmith cost converting them. I used a Imbel barrel on mine. Is gas regulator type A, B, or C? I believe it is a type A.. The BGS in 56 still used a type A. Steel or aluminum charging handle knob? I really don't know what is correct. I kept it similar to my early Izzy because of the time Period. There's just something about the polished bolt carrier and charging knob that I really like. I used a new aluminum knob from Ernest armory on mine.... Looks like they are out of stock. 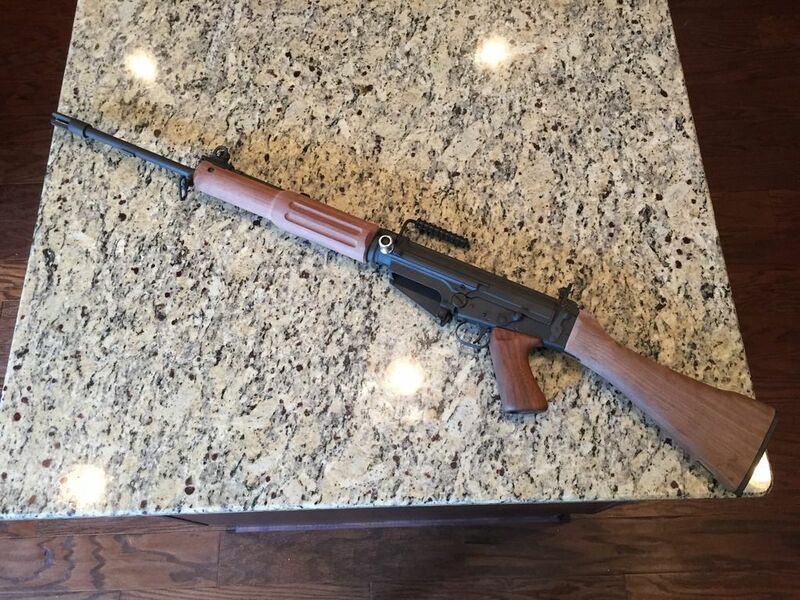 VERY NICE JOB on your Venezuelan FAL, good job! !